Gorilla Sleeve is engineered from flat, 50 mil wide filaments of tough and strong 6-6 Nylon to achieve a thick abrasion guard for use on hoses and cables exposed to harsh conditions. The product provides fuller coverage for increased resistance to abrasion and penetration, and still expands for easy installation over long lengths. The braided construction allows moisture dissipate quickly to prevent rot and fungus. 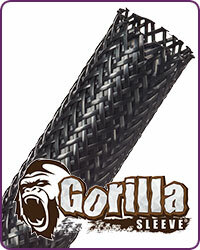 Gorilla Sleeve provides protection, easy installation and long-lasting good looks on any application.